Friedemann Schaber is a PhD Vehicle Design student at the Royal College of Art (RCA) in London. His research centres on the understanding of design in different societies – how it is taught and how ideas, visual and technical information are transferred between locations and markets. He teaches on the Product Design programme at the University of Northampton, introducing live client projects into the design curriculum; working with industry and community partners, including the footwear and leather supply chain. Friedemann is examining the creative usage of natural composites, leather and collagenic fibres in broader cultural contexts such as Japanese white leather, fish skin, lamination and the manufacture of composites. 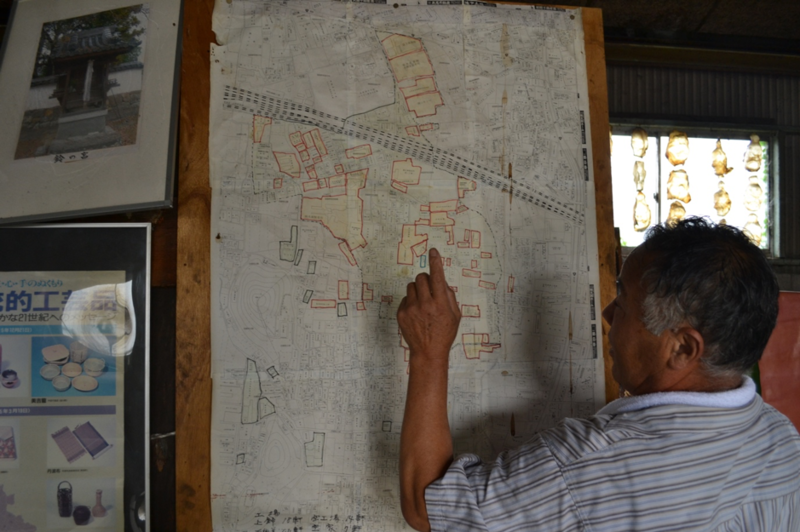 Some of these processes have been preserved in Kyoto, Hyogo and Nara Prefectures. 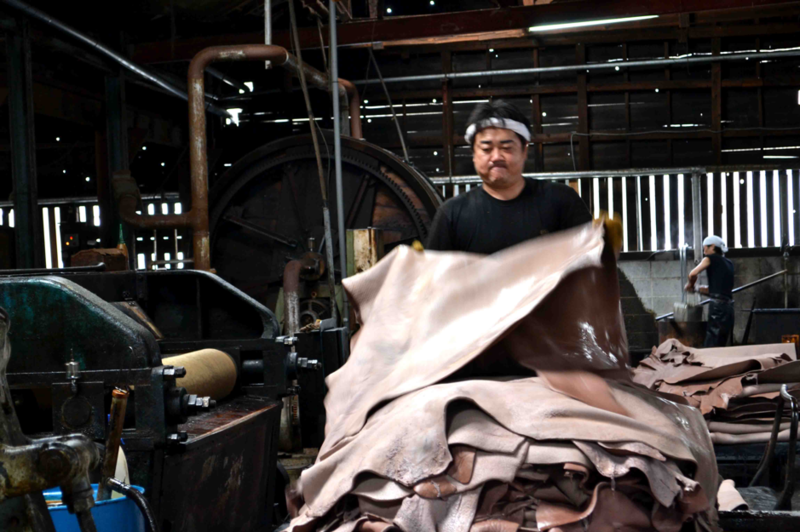 Preliminary fieldwork has been undertaken in Himeji and its cluster of tanneries supported by traditional artisans and a network of leather technologists. These material explorations are being further investigated through experiments at D-lab and at KIT’s Departments of Advanced Fibro-Science and Bio-Based Materials. Friedemann is investigating the potential for a lightweight bonded leather in conversation with natural fibres and laminates that include collagenic fibres, responding to market interest in novel bio-materials with good sustainability. There is demand for lightweight materials with enhanced performance properties that address the “end-of-life directive” in the automotive industry. 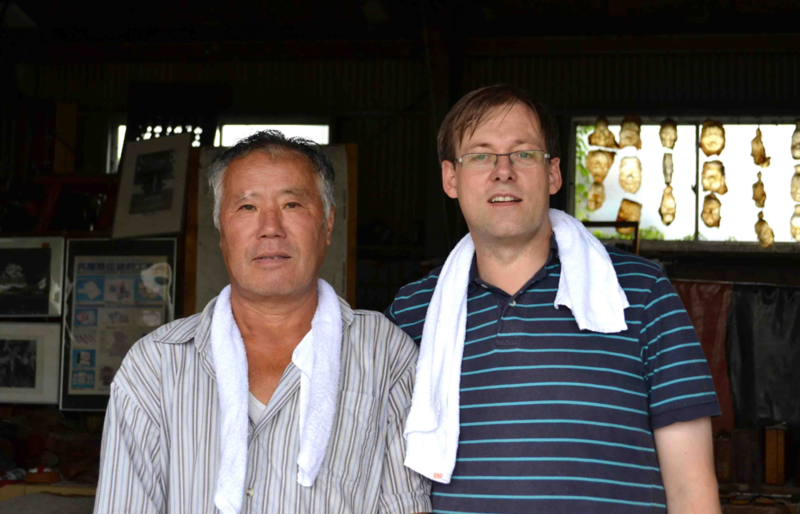 During his stay at KIT, he has Identified the scope for innovation within Japanese leather material and craft traditions through Interaction with artisans, technologists and scientists. He is currently exploring new product development concepts through interaction with the Bio-Based Materials Department of KIT. The collaboration between designers at D-lab and KIT’s materials scientists constitutes a case study of innovation in a traditional industry with the potential for new product development that will lead to industry regeneration. The practice and innovation will be captured in an illustrated glossary of terms and processes, leather trade locations and communities of practice. This handbook will record the experiments and interaction with designers, textile technologists and scientists as an exemplar of cross-disciplinary collaboration to achieve novel artefacts. 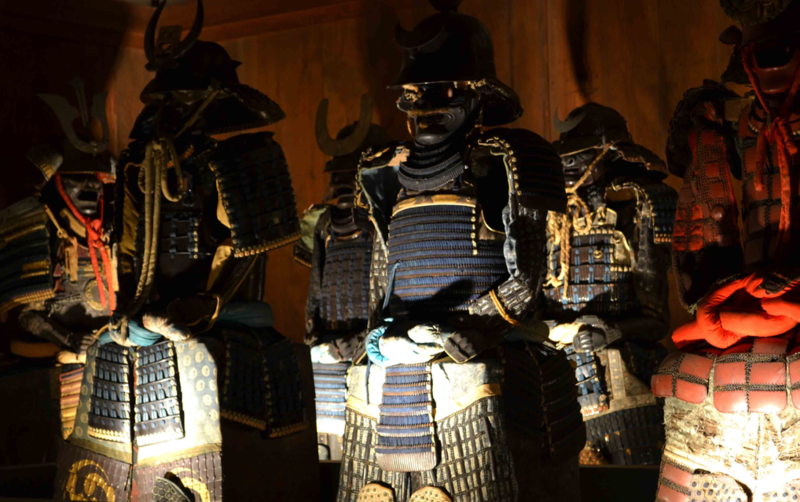 Samurai armour at Himeji Castle. Lamellar cuirasses lined with fusube gawa smoked leather. Once processed, leather lost its defiling properties and was recognised as being essential to armour production. 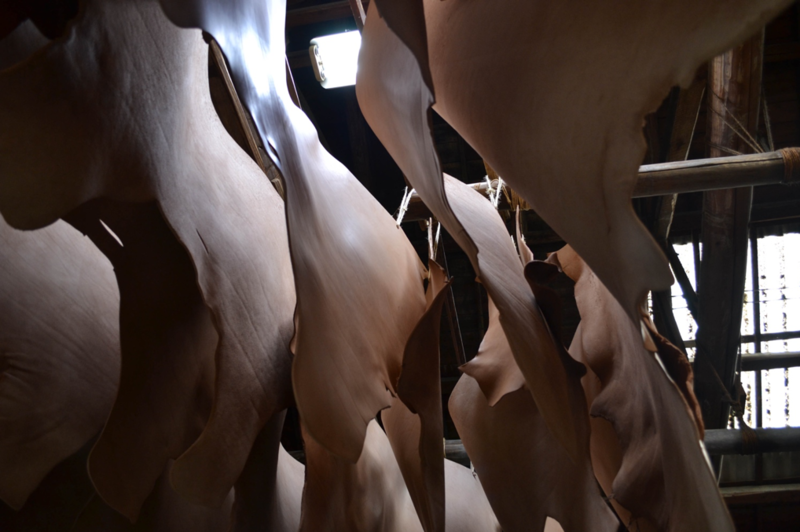 Drying of tanned skins in a well-ventilated shed. 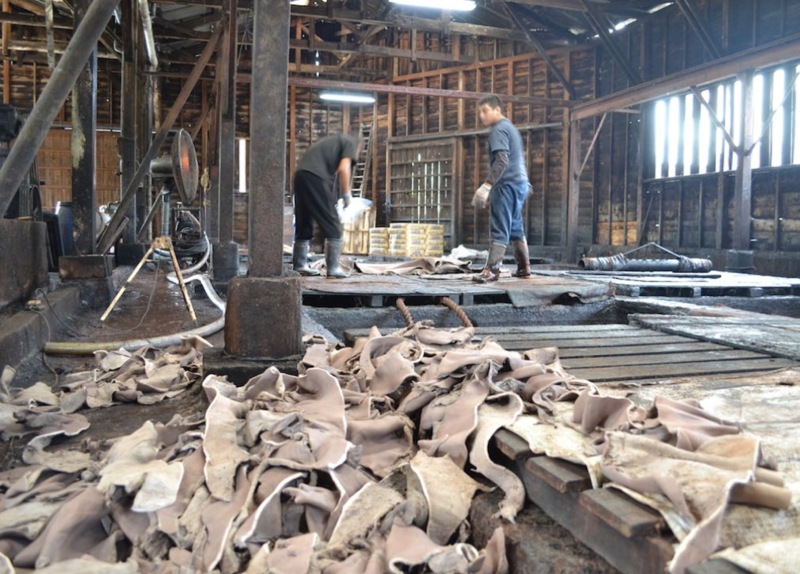 The subsequent sorting of the skins is crucial to the profitability of a tannery. Premium prices can charged for top-quality aniline leathers. Only when the skin has been unhaired, tanned and dried can grading effectively take place with any degree of accuracy. Skins are hung onto pegs in a frame and then immersed into a pit with a float containing the tanning liquor. The skins are allowed to soak to enable the tanning liquor to slowly penetrate the full substance of the hide. This process can take several months. 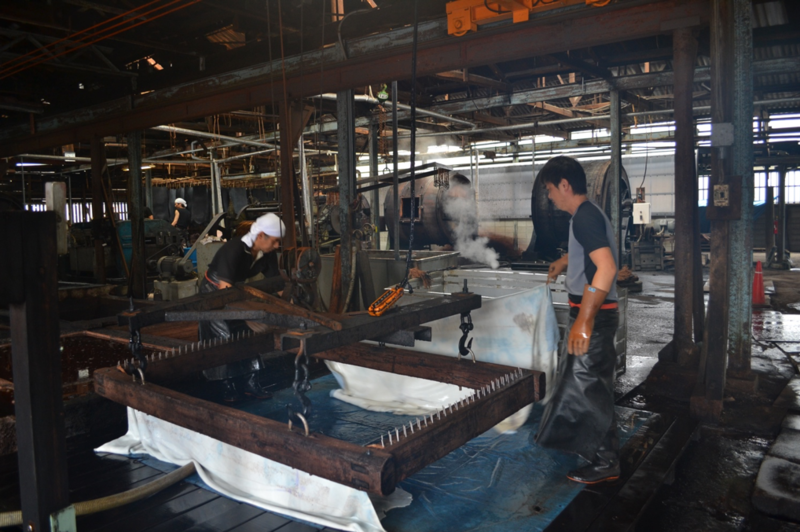 Once retrieved from the tanning pit the vegetable tanned leather is mechanically de-watered using a sammying machine. Upcycling waste and offcuts from leather production. The interaction with designers, leather technologists and scientists is an exemplar of cross-disciplinary collaboration to address sustainability and to achieve novel artefacts.